Now that the driveway, sidewalk and patio have had time to cure overnight, another grading is preformed to back-fill up to the level of the concrete. Fresh, loose topsoil is delivered and spread about 3 inches thick over most of the property, covering the clay and rock filled soil that makes up the ground here at the construction site. This soil should allow the grass to grow nicely once it is sown. If you are a homeowner who wants to make sure there is a grand entrance leading to your house, you need to choose exactly what materials to use. Deciding whether you should use pavers or concrete for walkways, what sort of lights will be installed, and so on, are things to consider when planning a walkway. When it comes to residential walkways, two of the natural choices homeowners gravitate towards are concrete and pavers. Concrete easily comes across as a cost-efficient option, but when thinking about the long-term expenses that will be incurred, the homeowner may end up shelling more money for repairs and maintenance. This is because one of the problems with concrete is its tendency to crack and decay. Concrete used for driveways and walkways creates an even, flat surface, but if a strong earthquake, flooding or prolonged frozen ground occurs, cracks may appear. Unusually heavy loads may also cause cracking. 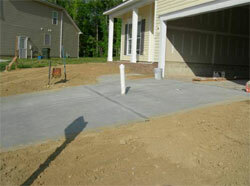 A type of concrete that is also widely used is stamped concrete. Stamped concrete is a design, like cobblestone or brick, which is pressed in the top of the concrete before it dries; thereby creating a look that resembles pavers. This is another material that conforms to abrasion resistance tests. When comparing concrete to pavers, the latter will emerge as more durable since it can accommodate loads or movement without cracking. When it comes to installation, though, a paving stone sidewalk may be more costly than one made of gravel and sand. Another upside of a paver walkaway, though, is that it is low-maintenance. In terms of what is more eco-friendly between the two, paving stones comes out as being kinder to the environment since it can allow a certain amount of rainwater to enter the ground and its materials are all-natural. The same cannot be said for concrete. Apart from offering the advantage of strength and flexibility in relation to poured concrete, pavers are also recyclable. On top of that, pavers are also more pleasing to the eye. In further assessing the advantages of pavers versus concrete walkways, people building homes will note that when contractors make mistakes installing pavers on a walkway, they are easier to correct. Discussing both options with designers or building experts, and a quick online browse of home improvement tips, will reveal that stamped concrete is not without its shortcomings. Stamped concrete's color may weather and many years down the line when repair becomes necessary, stamped concrete may entail a huge cost. Concrete can stabilize soft paving materials for driveways and walkways that are not exactly high-traffic. If you foresee wheeled vehicles travelling on your driveway/pathway, certain materials like cobblestone, flagstone and exposed aggregate concrete may not be ideal. You should opt for pavers that are also aesthetically pleasing to the eye, but are more functional. For homeowners who like to add decorative elements to their home, including outdoor areas like a walkway, brick may be a great choice. Particularly for design-conscious homeowners who want an attractive walkway but do not want costly repairs later on. Whatever the architectural style of your home, clay brick in deep red, brown and orange, or some other color the homeowner may desire, can dazzle. Brick materials in the marketplace may have a rustic look, or have a herringbone or cobbled design, or other pattern that can lend a formal or informal style. Homeowners can coordinate the material they use for their walkway with their patio or deck. When building a walkway, the help of a contractor may be sought to determine the most appropriate materials, whether you are considering pavers versus concrete walkways or other hard paving materials that will look appealing and can withstand abuse. Visiting your local landscape suppliers can be beneficial in this process. These suppliers usually have samples of all stones and supplies needed in creating a walkway. It is always helpful to see the stones in person to decide which one best suit your needs. Some suppliers will even allow you to take samples home to lie down on the ground near your home. This will help ensure you are choosing the right color and style for this project.